This is from yesterday. I've been wearing this jacket quite a lot now, and it's proven to be a very comfortable and versatile item. Good for to be thrown on when you leave in a hurry and works well as an odd jacket but also as an overcoat of sorts, when used with heavier knits and knit jackets. 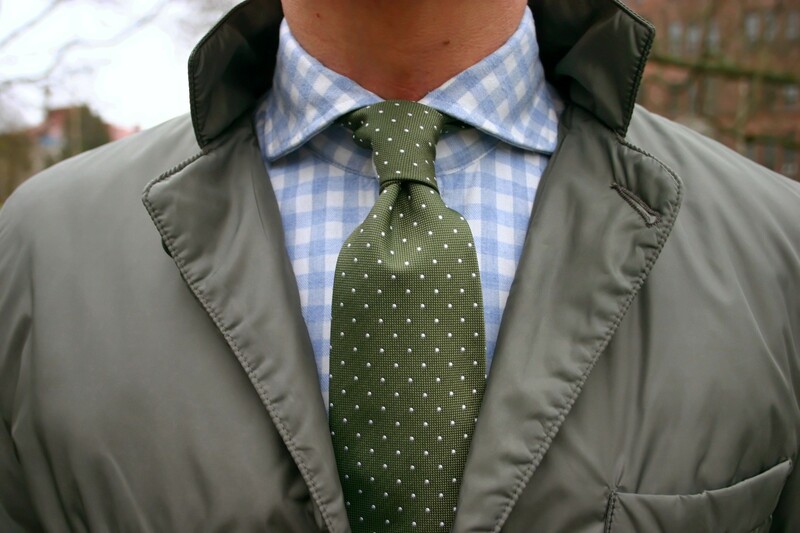 Here with a white blue gingham flannel shirt, olive Berg & Berg pin dot tie, espresso Equus Leather bridle leather belt, navy chinos and espresso suede chukka boots. A simple look, which pretty much works just as I wanted. Love how toned down blues and the olive tie work together with the olive-ish jacket. The navy chinos are from Brooks Brothers, and I can't say much good about them. I've had them for a long time, and even though the fit (after heavy alterations, mind you) is pretty perfect, they've been pressed with what seems to be some sort of super glue at the factory. I've tried everything I can think of, washing them with different detergents, soaking them in vinegar etc. but nothing seems to work. The original press marks are there to stay and just won't wash or fade away. Luckily I've finally found a replacement pair from PRL, a pair I scored of eBay for just 39 pounds yesterday. 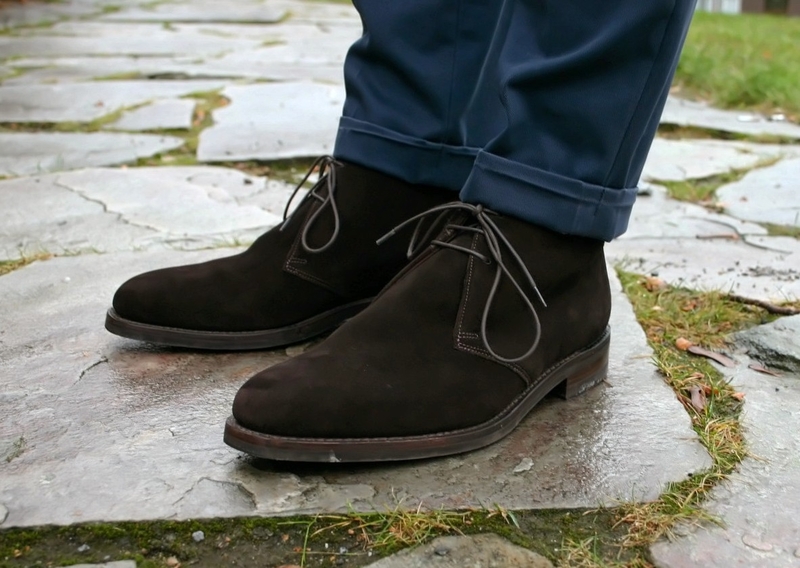 The suede boots are really what I wanted for this look, but other alternatives that I think would've worked well here as well include semi-heavy split toe derbies or perhaps a pair of slightly heavier double monks. 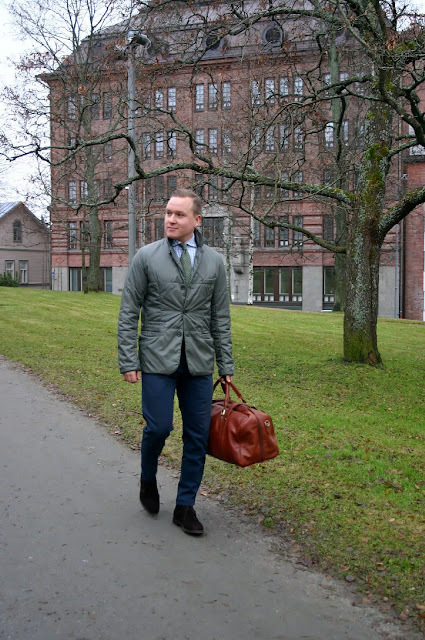 Next few posts will include a review of the holdall bag I have in the first picture, and I will naturally keep posting different kind of outfits. Like on Facebook and check back soon.